David has performed at many of the most prestigious wedding venues throughout the Midlands. He will create a customised 'wedding package' for your special day and will ensure that his incredible brand of magic is fed into your schedule in an appropriate fashion. David always works very closely with the wedding coordinators at the venues he performs at and has developed excellent working relationships with all the staff. 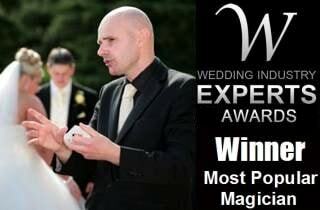 Magic is ideal for your guests during the drinks reception, wedding breakfast or evening celebration. 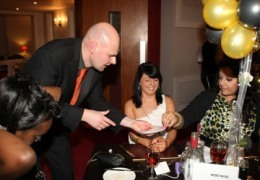 David can perform close-up magic, deliver an unforgettable stage show and provide balloon modelling for all those present. 1. David will provide you with a fully customised 'wedding package' for your wedding reception. He prides himself in his professionalism and drive to provide excellent customer satisfaction. 2. Your guests will be amazed by David's prodigious talents. Take the acclaim for booking such a magnificent performer. 3. 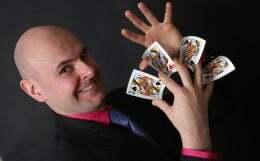 David is a highly experienced wedding magician who will enhance your day immensely. 4. You can relax and enjoy your day even more as David entertains everyone throughout the reception. 5. Magic appeals to people of all age groups. David loves to entertain children as well as adults.